We carry Medieval and Renaissance Tunics for the viking, Roman and Celtic. We have Saxon tunics, lionheart tunics, leather mantles, leather Overtunics and many more. Our Altair Vest is a sleeveless garment inspired by Assasin’s Creed. Reaches from the shoulders to the knees and made from soft, dyed cotton twill, this tunic can be worn by itself, or layered for more intricate look. Great for LARP. The Archers Green Over Tunic with Hood can be worn alone or with any under garment. It is shown here with our Huntingdon Brown Under Tunic #100988. The “archer’s” sleeves fall freely open when your arm is raised, while the full hood allows for perfect anonymity. Basic Medieval Tunic keeps you cool during the summer months. Lightweight tunic fits well and provides a perfect medieval period look. Contrasting border at the neck, hem and cuffs. Full length arms, worn by men or women. Great for LARP. This Musketeer Tabard is crafted in a rich blue cotton velvet, and fully lined in matching satin. The front, back, and sides are embroidered with the silver crosses and fleur-de-lis of the Musketeers. The edges are finished in silver trim. A dashing look that allows freedom of movement. Everymans Tunic was worn for hundreds of years. It would be hard to distinguish between a tunic worn in 13th Century England from one worn by Celts is Spain. Wear bare legged, with pants, tights or hose. Brass studed. This is the basic blue tunic of a slave, who was chosen to fight for his freedom in the arenas of Rome. This simple, rough weave tunic is made of 100% cotton with unfinished edges, giving it a peasant-like appearance. Our farmer's tunic is inspired by the early medieval period. The fabric is heavy and accurate to the period, a braided frog clasp and included black cotton belt complete the look. The elite guard of the infamous Cardinal Richelieu wore this tabard as a sign of his office. This blood red tabard is manufactured of heavy red cotton velvet with an antique gold rayon lining. The tunic features a unique, backed collar with a slanted neckline in the front, while also featuring full-length sleeves. The tunic has a long length and is opened from the waist down to create a graceful sort of flow in the garment, while the edges feature embroidered gold vine. The Celtic or Medieval tunic fits well for a Viking, Knight, Squire, Lord, or Celtic Costume. Can be used for infantry or archer units. Made for indoors and outdoors uses. Available in several colors and sizes. A sturdy, basic, everyday Half-Sleeved Cotton Tunic that leaves the forearms free for everyday tasks or showing off arm bracers. Appropriate for any Middle Ages outfit. Heavyweight, cotton twill construction suitable for everyday wear. A great simple costume for any event! Made of strong, durable 100% cotton fabric, these tunics have a full polyester lining. One-sized, they are open on the sides and have both a front and rear split for ample movement. Hand washable. Our LARP Tunic designed for LARP events and made from 2 layers of soft easy to care for material. Durable tunic can be worn as tunic or short sleeved medieval shirt. Designed to have a great rustic look and is fully Machine Washable. During the High Middle Ages all classes of people wore this knee length Archers Tunic. Usually worn with a long tailed hood. Very comfortable item of clothing, loose and cool, yet providing warmth against an evening chill. Cotton. The Medieval Rogue Cotton Tunic is a great piece of medieval clothing suitable for feast or everyday wear. Can be worn many of our medieval apparel. Combined with the archers green over tunic (#26-100986), the two make for an adventurous combination. 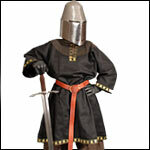 Our Knights Tunic is a typical Medieval Tunic made from tough durable cotton twill fabric. Trimmed in an attractive gold trim with leaves makes this Knights Tunic strikingly handsome. Made in the USA. This Long Sleeved Medieval Tunic has been worn throughout history, and even today is still used for some cultures in daily living and religious ceremonies. Our Greek Tunic has been used throughout history. We are talking all the way from the ancient Greeks to the Romans to the Medieval times. Our Faux Mail Tunic and Coif Ensemble are perfect for theatrical productions where real mail is too heavy or noisy. Made of a poly cotton material, these look like real metal under lights. Includes mail shirt, coif and mantle. The Knights Templar Tunic is made from a medium weight white cotton material. Large red velvet Templar cross has been stitched to the chest. Faux leather trim at the collar and shoulders. Splits both in the front and back, as well as both sides make it a perfect fighting tunic. This is for the tunic only. Medieval Crusader tunic in black with red cross made from medium weight black cotton. Red velvet cross, trimmed with faux leather at the collar and shoulders. Quartered with splits in the front and back. Matching cape available. Lionheart Tunic of the great king Richard I of England, known as Coeur de Lion and leader of the Third Crusades. Made from red cotton velvet, lined with splits in the front and back as well as both sides provide ease of movement. Hospitaler Tunic - Black with White Cross. Made from black cotton. White velvet cross stitched to the chest with faux leather trims adorns the collar and shoulders. Quartered with splits in the front and back. Hooded cape available. Crafted from medium weight white cotton, this knight tunic features a red velvet cross stitched to the chest. Brown faux leather trims the Crusader surcoat at the collar and shoulders. This fighting tunic is quartered with splits in the front and back as well as both sides, allowing for freedom of movement. The Knights Templar Tunic and Cloak set is made from cotton, includes a white colored tunic and cloak, both provided with a sewn red Templar cross. This was the typical dress of a knight of the Templar order from (1118-1314). The Hospitaller Tunic and Cloak set is made from cotton, includes a black colored tunic and cloak, both provided with a sewn white Hospitaller cross. This was the typical dress of a knight of the order of the Hospitallers. Our Norman, Saxon, Viking Cotton Tunic is suitable for early medieval historic periods. During the Norman and Saxon periods, men of all classes wore tunics. The sleeve and garment were cut as one piece using only one seam. The front was open a few inches and adorned with trim as well as the hem and sleeves. Worn under armor or by itself, the simple lines of this tunic are classic and lend themselves to many combinations of clothing from later periods of history. This oversized tunic extends to mid-thigh, giving it a distinctive look. Romans took the color of these tunics from the Spartan's red cloaks as later did the English army. Quartered in off-white and blood red panels with back-to-back golden lions rampant. Cotton, exclusive of gold trim. Dry clean only. A truly beautiful tunic of the Holy Land in a heavy, 100% cotton weave. The Tancred Tunic is a heavy off-white, 100% cotton tunic is perfect for any Prince of the Holy Land. A blood red Crusader’s cross is sewn to the chest, while gold trim forms both an outline and sun rays in four directions. Matching lining. Dry clean only. S/M or L/XL. The Roman Woolen Tunic was commonly worn by Roman men under the lorica armor, or by itself. Our tunic is crafted of thick wool. Comes in Red. Our Medieval Tunic comes in solid colors with 3/4 sleeves, a keyhole neck and is mid thigh length. They are available in a wide variety of color choices. This heavy, sleeveless Templar tunic comes in bright white cotton material. The Order's Maltese styled red cross has been appliqued over the heart. 100% cotton with a linen lining, dry clean only. Made of red cotton velvet, and fully lined, the gold satin cross and fleur-de-lis of the Musketeers emblazons the front of this tabard. Crafted in brown twill fabric, the sleeve and body of this Saxon Tunic were cut as one piece, using only one seam. The decoration on the edges is complemented by eyelets and cord at the sleeve and neck. Belt not included. This simple tunic is made from 100% woven cotton. The Roman tunic was very simple- two pieces of fabric were sewn together with slits left open for the head and arms. Influenced by Alexandre Dumas’ The Man in the Iron Mask, this tabard is made from black cotton velvet with a deep gold rayon lining. Embroidered crosses with fleur-de-lis are on the chest and sleeves of this garment. This cotton tunic features typical Medieval styling and half sleeves. In addition to reenactment use, this shirt works itself nicely into your regular wardrobe. From the age of William the Conqueror comes this courtly Norman Saxon tunic. Sturdy homespun blue and grey cotton twill. Matching period trim and a double-wrap belt is included. Woolen Viking Tunic made from 100% wool, the rich fabric is heavy and accurate to the period. The sleeves, collar, and hem are accented with a thick Nordic design trim. An authentic addition to your Viking wardrobe. Dry clean only, available in brown or grey. The sleeves and hem of this short tunic are accented with a Greek trim which emulates the waves of the Aegean. Made of 100% cotton, this tunic works well by itself or under armor. Belt and other items sold separately. Perfect for Viking, Saxon Norman time periods and with the right accessories can be worn for any medieval event. Viking or Medieval Half Sleeve Tunic is made from sturdy cotton fabric. Comfortable for Faire or Weddings. Richly decorated with silver embroidered trim. Invoke the power of Thor with our new Thors Hammer Viking Tunic. Thor, the Norse God of weather, wielded his mighty hammer against the forces of evil. Cotton fabric to keep you cool and comfortable. Made in the USA. The Travelers Inner Tunic slip on design with long sleeves and is slightly longer than the outer tunic. The Travelers Outer Tunic slips over the inner tunic. It is split up the sides for ease of movement. Natural muslin. Can be worn with a belt. Viking Noble Tunic in Cotton from heavy 100 percent cotton with wide, edging at collar and bottom of tunic, along with Viking period trim on sleeves and hem. Side slits at waist make for great maneuverability. Lace-up front. This Teutonic Knight Tunic is made from medium weight white cotton. An imposing black velvet cross is stitched to the chest, and faux leather trims the collar and shoulders. Splits in the front and back as well as both sides make it a perfect fighting tunic and allow room for riding. The Teutonic Crusader Knight Tunic and Cloak set is made from cotton, includes a white colored tunic and cloak, both provided with a sewn black Teutonic cross. This was the typical dress of a crusader knight of the Teutonic order.